When I was a little, mischievous girl, we lived on a block in Washington Heights that had one tree struggling to survive planted in front of our apartment’s first-floor gated windows, where I would yell out to my friends when they were playing late into the night, while my sister and I had to go to bed much, much earlier, enviously listening to the sounds of whooping and hollering coming from the neighborhood kids. That window was an opening to the world outside and just as critically an escape from the oft “anxious” lives of the inhabitants inside. One day - being a naughty child, I decided to shout out the window that I was a “ Red Commie“ - not understanding what those words even meant but the image was beguiling. I will never forget the rush of being pulled away from my “escape” outlet and scolded with an intensity that I had never seen in my quiet, gentle father. This was serious and my first introduction to the gravity of politics and how it affects all our lives - instilling fear and resistance. 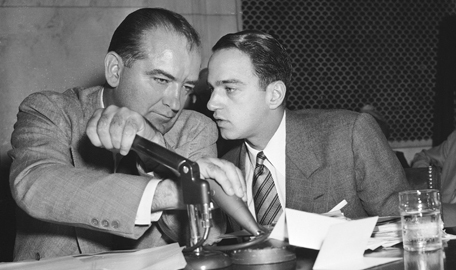 Joseph McCarthy’s Chief Counsel was Roy Cohn who later became Donald E. Trump’s lawyer and mentor. was a good little girl and did not yell out the window!! !